Google employees are unknowingly building death machines, and they're not happy about it. “Don’t Be Evil” has been one of Google’s corporate maxims for over 15 years. But it’s recent dealings with the Department of Defense has put that ideal on ice. For some reason, Google’s workers aren’t psyched about this! The letter’s got some pretty direct language, calling the company out on its loss of the aforementioned core value: “Google’s unique history, its motto Don’t Be Evil, and its direct reach into the lives of billions of users set it apart.” The commoditization of people’s personal data (ergo, their psyches) not withstanding, obviously. 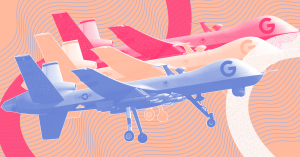 Gizmodo reported on Project Maven earlier last month, when they described it as “using machine learning to identify vehicles and other objects in drone footage, taking that burden off analysts.” Google and the Pentagon fired back, stating that the technology wouldn’t be used to create an autonomous weapons system that can identify targets and fire without a human squeezing the trigger. Thing is, Google’s far from the only tech industry player in cahoots with the military. Red flags immediately went up when news broke that a team of researchers from the Korea Advanced Institute of Science and Technology (KAIST) was partnering up with weapons company Hanwha Systems — a company that produces cluster bombs, not exactly a popular form of warfare, as far as these things go. Fifty researchers from thirty countries called for an immediate boycott of the Korean institute. So that’s fun! And if Google’s recent advancements in AI tech faced a similar fate, think: Weaponized autonomous drones, equipped with private data, and a sophisticated AI. Not saying this is exactly how SkyNet starts, but, this is basically how SkyNet starts. The counter to this argument, insomuch as there is one, is that these technological developments lead to better data, and better data leads to better object identification technology, which could also lead to more precise offensives, which could lead (theoretically) to less civilian casualties, or at least (again, theoretically) increased accountability on the part of the military (analog: the calculator should make it exponentially more difficult to get numbers “wrong” on your taxes, so the automated hyper-targeted death robots should make it exponentially more difficult to “accidentally” murder a school full of children). All of which should go without saying that collaboration between the Department of Defense and various Silicon Valley tech companies is a dangerous game, and we have seen how quickly the balance can tilt in one direction. Having informed tech employees call out their CEOs publicly could hopefully lead to tech companies choosing their military contracts more carefully, or at least, more light being shed on who’s making what technologies, or rather, what technologies Silicon Valley coders are unknowingly working on. More likely is that it just results in these companies being more discreet about the gobstoppingly shady (but profitable!) death machine work they’re doing. Good thing — like the rest of the world with a brain in their heads — we’re all ears.